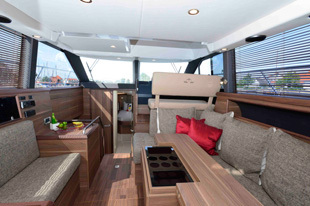 Few boats will garner as much attention this year as the Sealine F380. There are two main reasons for this: one is that it is a new Sealine and that never fails to grab headlines, especially in the UK. 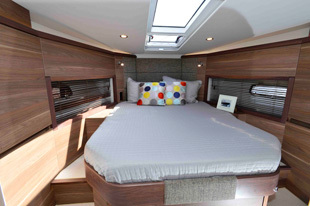 The second is that, as has been well documented, Sealine is now German and part of the vast Hanse Group stable. How will this quintessentially British brand fare under the stewardship of a German production builder, a builder that specialises in the construction of sailing boats? Well, from our two-day sea trial near the Hanse factory in Greifswald, northern Germany, it has to be said the early signs are very promising. Hanse’s super-efficient and technologically advanced factory (capable of churning out 2,000 boats a year at full capacity) aside, the boat itself is very good. We expected the driving experience to be enjoyable – the F380 is based on the universally praised SC35 (now called the S380) – but the reality was so much better than the perception. 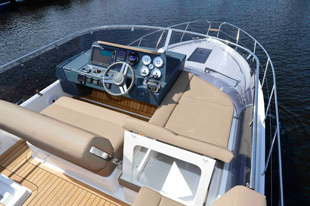 Twin Volvo Penta D6 330s on sterndrives may seem a lively choice for a flybridge of this size but once you get over the initial shock of how agile the thing is it’s just enormous amounts of fun. Some of the most fun I’ve had behind the wheel of any boat, in fact, and I’m including 700hp RIBs in that. There is far more to this boat than an inherent ability to make you smile from the helm seat; the amount of accommodation that Sealine has managed to fit (I nearly wrote “squeeze” there but the truth is it doesn’t feel squeezed in the slightest) on board, for example. Our full review of the F380 will be in the September issue of the Motor Boat & Yachting, where you can read more about what is a massively important boat for Sealine and its parent brand. For now, though, let’s just say the future is looking as bright as it has done for a long time for Sealine.